Feliz Cumpleaños, Dra. Guadalupe Rivera y Marin! (today Oct. 23). Diego’s daughter heads the Fundación Diego Rivera and is an Honorary Trustee of San Francisco’s Mexican Museum. She was part of our mural’s International Advisory Committee convocation in 2000 and in May 2006 hosted Julia and me in Mexico City for her Encuentro Internacional de Pintura Mural. I send along Pedro Infante and Las Mañanitas. It’s now public, the mural has been appraised at $50,000,000.00 What a relief; it turns out that I haven’t wasted the last 20 years of my life. 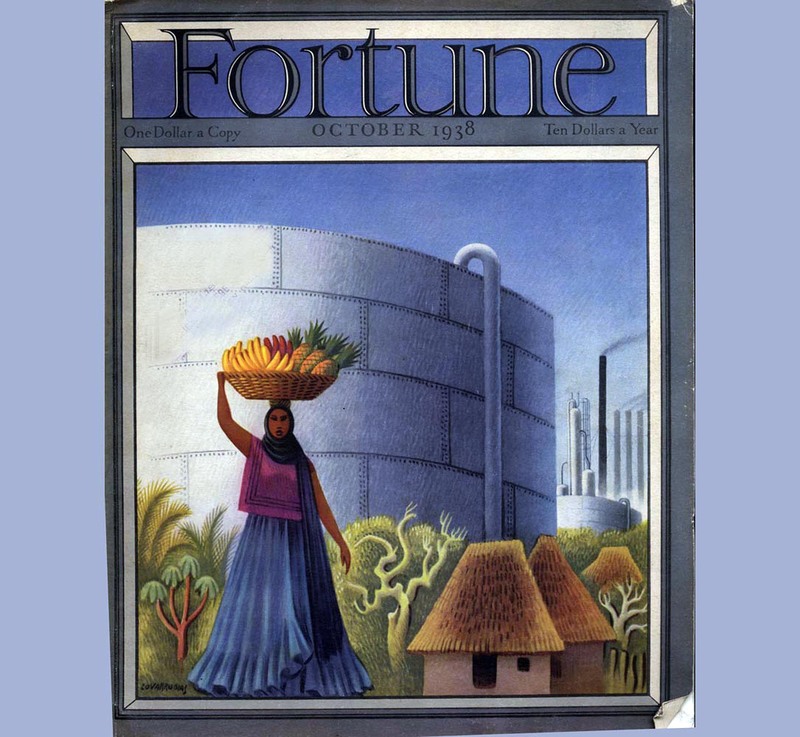 Lewis Sykes, who was recently honored at the Foundation of City College’s Basic Skills Luncheon fundraiser, has graciously donated a pristine October 1938 Fortune magazine with a cover by Miguel Covarrubias and an article, illustrated by Diego, about the 1938 Mexican oil expropriation. This was a reminder that although Rivera was in artistic exile from the US from 1934 until he returned to do our mural in 1940, he was not forgotten. In researching the magazine I came across a troubling 1938 Fortune magazine survey about US popular attitudes on Jewish refugees, among other issues. The data quantifies the atmosphere Rivera found when he arrived in 1940; the atmosphere which shaped our mural. Looking forward in December to LACMA’s upcoming Picasso and Rivera: Conversations Across Time. Our mural’s image will appear in the show. Had a nice mural visit from Judi Leff, Director of Arts and Cultural Programs for Congregation Emanu-El. Her parents Bobbie and Henry taught at CCSF, back in the day. Judi was accompanied by Joseph Amster (Emperor Norton) and Rick Shelton (Lola Montez). All 3 are members of the SF Historical Association, which has extended an invitation to me to speak next year. Our revitalized website, www.riveramural.org, is progressing. Camille Mai, our web designer, is constructing an attractive framework on which to load all the information we have. Take a peek. The larger, hi-res images are the most important initial improvement. Editing 20 years-worth of writing will be my next year’s work. As I reported last time, Julia Bergman and I wrote abstracts of the Gladys March papers we found in Canada. Researcher friends immediately responded to this last missive. “Did you find anything on ‘so and so’ in the papers?” One request regarding Albert Bender, a figure in Rivera’s “autobiography”, made me realize that his story hadn’t been in the notes. Embarrassingly, I had been oblivious to the obvious; this was not the whole cache of Gladys March’s notes. Maureen Bourbin has volunteered to reconcile the abstracts with the chapters in the book to see exactly what is missing. Somewhere out there (hopefully) is another treasure trove of notes for the book. Alas, it took 15 years to find the first batch. Casting a wider net with the website is one hope. Just got back from a week in the sparsely-populated, high desert (6000’) 40 miles north of Las Vegas. Was hanging out with my best friend Dave Braun (we grew up across the street from each other and went into the USMC on the buddy-plan. You don’t get much tighter.) Went there to get away and work on my “Gershwin in Mexico” play. Got to mix & pour concrete, too. Elk and wild horses routinely passed by my window at night. Early in August Julia Bergman and I made our long-awaited research trip to see the draft notes for Diego Rivera’s “autobiography” My Art, My Life. In 1944 Gladys March started interviewing Rivera in Mexico. She visited periodically until just before his death in 1957, when she realized that 2000 pages might be enough. For over 15 years we had been intrigued that these pages shrunk into only a slim 190 page book. Last July I explained how we serendipitously found these “lost” papers. Our Canadian host (who requested anonymity) only permitted us to make hand-written transcriptions. Over 3 days in a windowless room (Umberto Eco’s Name of the Rose came to mind) we took notes to later craft an abstract of the papers, a mélange of various numbering systems, marginal scribbling, and different voices. Some stories were copied in their entirety. We found episodes which didn’t make the book or were notably modified and even a hilarious story March never meant for the book. At Diego’s goading Gladys went to Hollywood to visit one of his friends, a movie “sexpot” (you-know-who). The ingénue Gladys recounted that she was not quite ready for the alarming moves put on her as she was plied with absinthe, which evidently didn’t make her heart grow fonder. A surprise find, not part of the Gladys March Papers, was a binder containing both sides of the correspondence relating the genesis of one of Rivera’s self-portraits, which is owned by our host. Most often, in doing our research we have to speculate on what was said in reciprocal letters. Some letters were already public, but these additional missives illuminated the saga of a single work. Included were a few letters by Frida, complete with the obligatory lipstick prints. The papers were also a sad reminder that our mural was contractually slated to end up THREE times as large. The U.S. entry into WWII and the subsequent segue into the “Cold War,” prevented Diego, a born-again, post-war Stalinist, from ever returning to the U.S. to finish the job. If he had returned during the Joe McCarthy era, the uproar around the 1934 Rockefeller incident might have, in comparison, only looked like a slight difference of opinion. Fortunately, the destroyed Rockefeller mural was “replaced” by a slightly smaller version that Diego painted at Bellas Artes. For insurance purposes the College recently commissioned an outside professional appraisal of the mural’s “replacement value” (this appraisal has its own confidentiality constraints.) This seemed a daunting task, but there are professional protocols for using comparable works of art, if available and appropriate, as benchmarks. The resulting appraised value is appropriately large. But how do you rationalize a metric for the incomparable? It is difficult to monetarily quantify the fact that this 1940 mural was the sole major piece in Diego Rivera’s “farewell tour” of San Francisco, where his work in the U.S. had started in 1930. Specifically emulating him, the WPA’s Federal Art Project was founded in 1935. Our vast mural is a coda; the bookend to a decade-long era for Rivera, San Francisco, and the United States. What are appropriate historical “comparables”? Is there a “bonus” value for it being Diego’s single largest [contiguous] mural, as he reiterated in the Gladys March papers? (“Bonus” value: Kind of like having a 4.2 GPA or like Spinal Tap turning the volume up to 11.) Absolutely unique in Rivera’s oeuvre is his depiction of the United States; evoked as the flag-draped arm, the muscular savior against aggression. The only military and industrial power that could halt Hitler, he had presciently written elsewhere in late 1939. The historical irony is that at this idiosyncratic moment, before WWII reached the Americas and before Hitler fatefully invaded his erstwhile ally the USSR, an internationally prominent Mexican communist found the United States to be his natural ally. Certainly, no “comparables” there. Ever. Since these arcane facts couldn’t be factored into the appraisal paradigm, I feel that the resulting appraised value is too low. But, then again, so would any dollar value for our priceless mural.